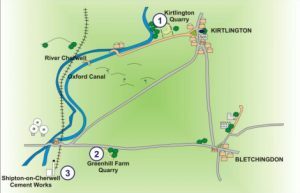 The area surrounding Kirtlington and Bletchingdon has a geological history that goes back about 165 million years through time, and the rocks, landscape and building stones that you can see along the trail tell us a lot of information about what this geological history was like. The area is underlain by Jurassic limestones, which are part of the Great Oolite Group and formed when Oxfordshire was submerged under a warm tropical sea. The limestone is packed full of the fossils of Jurassic creatures that thrived in these tropical conditions, including one or two dinosaurs! The area also provides lots of evidence for a much more recent geological event, the Ice Age, when powerful ancient rivers flowed through the area thousands of years ago. 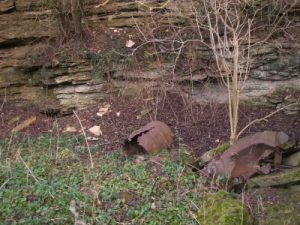 The rocks that outcrop here are very good for the production of cement, and there are many disused quarries in the area to remind us of this important industrial past. Kirtlington Quarry exposes limestones and clays of the Great Oolite Group that formed in the Middle Jurassic around 165 million years ago. The quarry, like many of the other quarries in the area, was used for the production of cement, and was worked for cement from 1907 to 1928. 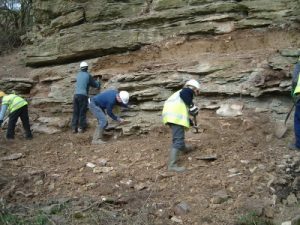 The Jurassic rocks exposed in Kirtlington Quarry provide lots of evidence to tell us what the environment would have been like at the time these rocks formed. It is thought that Kirtlington lay near to the shore of a small barrier island, in a coastal environment, and would have been similar to the Florida Everglades today. These conditions attracted many animals to Kirtlington, and the quarry is famous among geologists for its rich diversity of fossils. Dinosaur bones of a 15m long Cetiosaurus, and the tooth of a Megalosaurus have been found here, along with the teeth of flying reptiles called pterosaurs, and the remains of sharks, Long-Snouted Crocodiles, and a large marine reptile called a Plesiosaur. 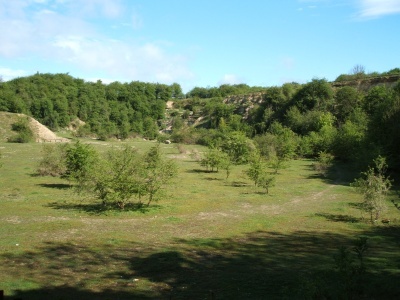 Kirtlington however, is most important for its mammal fossils, and the quarry is the richest mammal-bearing locality of Middle Jurassic age known anywhere in the world. 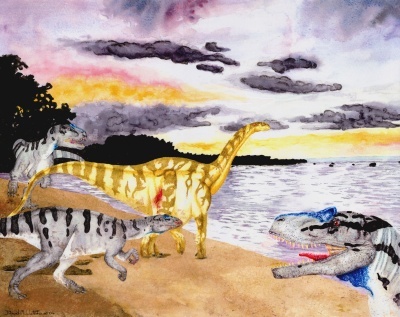 An artist’s interpretation of how Oxfordshire may have looked in the Middle Jurassic, with Megalosaurus (front) and Cetiosaurus (behind). Greenhill Farm Quarry is a disused aggregate and cement quarry, which was quarried from at least 1875 and probably finished in the mid 1940s. The quarry exposes Middle Jurassic limestones that are about 165 million years old. The rocks here are so important because they provide lots of clues to tell us what Oxfordshire would have been like 165 million years ago, when these limestones formed. England was much further south than it is today, and Oxfordshire would have been at the same latitude as present-day North Africa. The limestones formed in a tropical sea that covered the area. The rocks here contain lots of fossils of the creatures that lived in this Jurassic sea, including shellfish and sea urchins. OGT cleared some of the rock faces in Greenhill Farm in February 2005 as part of an Aggregate Levy Sustainability Fund (ALSF) project. The clearance has allowed us to see the rocks that were covered with vegetation and scree. We were then able to record and log the rock sequence to give us a permanent record of the geology. The photos show what a big difference we made in one day! There is no public access to Greenhill Farm Quarry. Permission must be sought from the landowner. Shipton-on-Cherwell Quarry was for many years, the largest limestone quarry in the county, and the towering chimneys serve as a reminder of the area’s industrial past. However, the site is also very important for its geology, and for this reason has been designated as a SSSI (Site of Special Scientific Interest). The rock quarried at Shipton-on-Cherwell formed in the Middle Jurassic around 165 million years ago. The exposure at Shipton-on-Cherwell is on such a large scale that it provides a unique opportunity to see how the rocks change laterally along the exposure, and the quarry therefore represents one of the most important localities in Britain for rocks of this age. The quarry is also well known for its fossil reptiles, particularly crocodile fossils. The first recorded British Middle Jurassic crocodile came from Shipton, and many more crocodile remains have been found here. The quarry has yielded the best existing collection of Middle Jurassic crocodiles in the world. Stenosaurus: a Jurassic crocodile whose remains have been found in the quarry. There is no public access to Shipton-on-Cherwell quarry. Permission must be sought from the landowner.